Cambridge Partners & Associates provides clients with market feasibility and impact studies in order to determine the feasibility of a proposed new project or the redevelopment of an existing property. Many clients and their investors/lenders seek a third party analysis to independently ascertain if there exists sufficient demand and revenue potential for their commercial, residential, multifamily or other type of project. Federal tax credits are key incentives for the construction and redevelopment of low-income, rent-restricted housing. 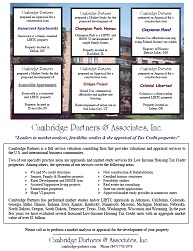 Because of our knowledgeable backgrounds and expertise, Cambridge Partners is one of the premier firms nationally in terms of its experience in the appraising low-income, rent restricted housing. We are able to provide special insight in these highly technical valuations. Many state housing authorities have established a Qualified Allocation Plan, or QAP. These QAP’s are an integral part of the tax credit application process. Most QAP’s explain a housing authority's application and review process, including scoring and the underwriting process. Cambridge Partners is familiar with many of the nation’s Qualified Allocation Plans and prepares market/feasibility studies to conform with these requirements. Delineating the market area from which the property will most likely draw its tenants. We describe the property’s location relative to nearby employment centers, educational and medical facilities, recreational facilities and municipal transportation links within the market area. Reporting local and regional economic demand generators and their influence on household incomes in the market area. Calculating the number of income-qualified renter households for the predetermined year in the market area using census data and other demographic services. We also estimate projections of income qualified household growth in the market area using census data and other demographic analysis. Reporting demand for public housing based on conversations with public housing authorities in the market area. Reporting on the potential supply of new (competing) units over the next year. Describing the demand for housing based on existing and potential household growth within the market area. This will be compared to the supply of apartments within the market area. We will then calculate demand rates and absorption rates for the subject property. Analyzing and reporting occupancy rates of comparable properties similar to the subject property. Reporting and contrasting the rent and amenity packages of the comparable properties to the planned property. Describing the impact of the planned property on the existing affordable housing properties in the market area. Feasibility Study of a performing arts center located in the former Carnegie Library. The property will offer the community various arts classes, multimedia and television studio training, and many other services. Market study and a Feasibility study of a Historic building which will be converted into a senior-oriented, mixed-income housing facility. Appraisal of a major State University campus building which will be renovated and partially financed by federal historic rehabilitation tax credits. Market study of a 125+ unit supportive living facility that is restricted to senior citizens over the age of 65 years who are income qualified. Market study of a historic hotel located along the Mississippi River that has a natural mineral springs bath. The property will be refitted for use an apartment building. Market study for a development which would comprise 42 single-family houses, thirty-seven of which would have income restrictions. Appraisal of a multifamily farmworker-oriented LIHTC property which will also receive specific state and farmworker tax credits. Market Study for a scattered site Hope VI rental home project, with an additional 25+ homes which would be for sale, subject to income restrictions. To date, Cambridge Partners has undertaken Market Studies and/or tax-credit valuations in Arkansas, California, Colorado, Georgia, Idaho, Illinois, Indiana, Iowa, Kansas, Kentucky, Minnesota, Missouri, Michigan, Montana, Nebraska, North Dakota, Oregon, South Dakota, Tennessee, Texas, Utah, Washington, Wisconsin and Wyoming. In the past ten years, Cambridge Partners has evaluated several thousand Low-Income Housing Tax Credit (LIHTC) apartment units with an aggregate value in the hundreds of millions of dollars. Moreover, as we render appraisal services for some of the major banks with LIHTC loans, we are often able to save our clients time/money by performing both market study and appraisal services.